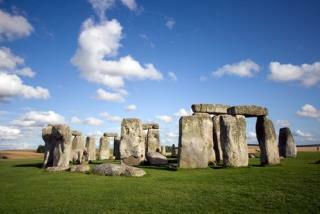 (Newser) – New digging at Stonehenge sheds some light on the ancient site's mysterious ties with the summer and winter solstices. Contrary to what some have speculated, the landmark wasn't built for some sort of sun-worshipping ritual, says a researcher, nor was it "some kind of calendar or astronomical observatory." Instead, Ice Age meltwater formed ridges along the solstice axis—the directions of the summer solstice's sunrise and winter solstice's sunset. Stonehenge's creators dug around the ridges to form a path ending at Stonehenge; researchers made their discovery by digging around this path, known as the Avenue, the Guardian reports. Digs also indicate that the site was once a full circle of stones. By next year, a highway near the site is set to be replaced by grass. It's a transmitter. It's a radio for speaking to God. In Minecraft I make odd landmarks to tell where I am. Perhaps they did the same.